Once you eat one, you just can’t stop! Well if we were talking about potato chips, I would say that’s a problem. However, it’s not a problem when we’re talking about kale chips! In fact, I encourage it. Kale chips have become all the rage lately, and for good reason. They are absolutely delicious, so healthy (loaded with vitamins K, A, C), well known for their cancer fighting properties, AND you can eat almost two cups of chips for fewer than 100 calories! Move over potato chips… a new sheriff is in town (well, you get my point). There are endless ways to season and prepare Kale chips, I’m going to start by giving you the basic recipe, along with some tips to cook the best kale chips, and then I’m going to give you three of my favorite varieties. Hold the applause. PLEASE be creative and use your favorite seasonings to come up with your very own varieties. This is where the fun begins! Keeping our bodies in shape is hard work…and yes it absolutely does mean making sacrifices when it comes to the foods that we choose to eat! However, the key is to still enjoy the foods that you love by simply recreating them into a healthy version. That’s what I’m here for! I’ll take the guesswork away from you and bring you new recipes each and every week! It’s all about ingredient swaps! As my trademark proclaims, I will always do my best to deliver to you: 100% Taste, 0% Guilt! Use the lowest temperature your oven will allow (some ovens has a “dehydrate” function that bakes at 130 F). A lower oven temperature will dry out the kale without risk of browning the leaves. 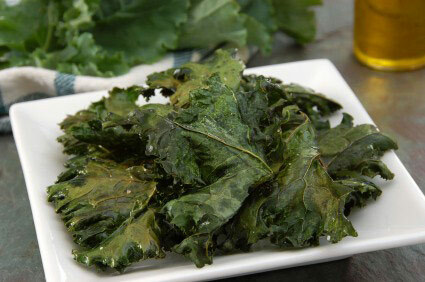 Bake your kale on a cooling rack or similar tray so any moisture evaporates instead of “steaming” the leaves. If you don’t have a rack, you need to be extra sure the leaves are completely dry before placing it on a parchment lined pan. If you have finally caved to the kale chip obsession (hello!) consider getting a food dehydrator for perfect chips every time. Remove kale leaves from the stem and rinse in water. Dry the leaves as best you can (use a salad spinner, or do it ahead of time and let air dry on clean kitchen towels). Make sure the kale leaves are very dry after washing. Any moisture left on the leaves will create soggy leaves. Toss kale with oil and salt in a large bowl. Place leaves in a single layer on a wire rack over a sheet pan or a parchment lined pan and bake until crispy, about 30-45 minutes for 250 F oven or a few hours if your oven has a “dehydrate” function. Prepare as directed above, except add the following ingredients to the bowl in step #4: ¼ cup low-fat sour cream; 1 tsp ea— dried parsley/apple cider vinegar, ¼ tsp ea: onion powder/garlic powder, pinch black pepper. (Adds approx. 25 calories per serving). Prepare as directed above, except add the following ingredients to the bowl in step #4: 2 TB ea— no sodium added tomato paste/apple cider vinegar/water, 1 packet stevia, 1 tsp prepared yellow mustard; ¼ tsp ea— onion powder/garlic powder/cayenne pepper. (Adds approx 15 calories per serving). Prepare as directed above, except add the following ingredients to the bowl in step #4: 2 tsp cinnamon, 1 tsp vanilla, ¼ cup sugar-free maple syrup, 1-2 packets stevia. (Adds approx 15 calories per serving). If you have any specific requests or would like to share your feedback on the above recipes, please e-mail Allison Frahn at AliFrahn@yahoo.com.